2008 Ph.D. in Music (Ethnomusicology), University of California, Berkeley. Committee: Ben Brinner (supervisor/chair), Jocelyne Guilbault, Charles Hirschkind, Paul Théberge (external). 1997 M.A. in Music (Ethnomusicology and Interactive Computer Media), Wesleyan University. 1994 B.M. in Music Composition, University of California, Santa Barbara. 2018 Critical Approaches to the Production of Music and Sound, co-edited with Samantha Bennett. New York: Bloomsbury Academic. Finalist for Association of American Publishers PROSE award (2019). 2016 Digital Tradition: Arrangement and Labor in Istanbul’s Recording Studio Culture. Oxford University Press. 122,000 words. Finalist for ASRC Excellence Award. 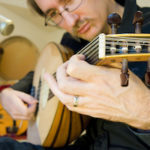 2011 Music in Turkey: Experiencing Music, Expressing Culture. Global Music Series. Oxford University Press. Mandarin translation published by Oxford University Press in 2016. Persian translation published by the Mahoor Institute in 2018. 2019 “Technological Encounters in the Interculturality of Istanbul’s Recording Studios” El Oído Pensante. 2019 “Actor Network Theory and Organology.” Journal of the American Musical Instrument Society 44. 2013 “Popular Music Studies and the Problems of Sound, Society and Method.” IASPM@Journal 3(1): 15-32. 2012 “The Social Life of Musical Instruments.” Ethnomusicology 56(3): 363-395. 2012 “What Studios Do.” Journal on the Art of Record Production 7(1). 12,008 words. 2010 “Mixing for Parlak and Bowing for a Büyük Ses: The Aesthetics of Arranged Traditional Music in Turkey.” Ethnomusicology 54(1):81-105. 2009 “Ron’s Right Arm: Tactility, Visualization, and the Synesthesia of Audio Engineering.” Journal on the Art of Record Production 4(i). (2020) “Feeling Analog: Using Modular Synthesizers, Designing Synthesis Communities.” In The Cultural Study of Musical Instruments, ed. Stephen Cottrell. Invited chapter; under contract. (2020) “The Interface and Instrumentality of Eurorack Modular Synthesis.” In Rethinking Music through Science and Technology Studies, ed. Christophe Levaux and Antoine Hennion. Routledge. Invited chapter; under contract. (2019) “Agency in Contemporary Recording Production.” In Oxford Handbook of the Creative Process in Music, ed. Nicolas Donin. Oxford. Invited chapter; under contract, accepted. (2019) “Music in Turkey: Contemporary Recording of Traditional Music.” In Global Music Cultures, ed. Bonnie Wade and Patricia Campbell. Oxford. Invited chapter; under contract, accepted. 2014 “Music, Mobility and Distributed Recording Production in Turkish Protest Music,” in Oxford Handbook to Mobile Music, ed. J. Stanyek and S. Gopinath. New York: Oxford, p 339–60. 2004 “Glitches, Bugs, and Hisses: The Degeneration of Musical Recordings and the Contemporary Musical Work,” in Bad Music: The Music We Love to Hate, ed. C. Washburne & M. Derno. New York: Routledge, p 212–25. 2019 Experiencing Armenian Music in Turkey: An Ethnography of Musicultural Memory, by B. Yıldız. Asian Music 50(1). 2016 The Musicology of Record Production, by S. Zagorski-Thomas. twentieth-century music 13(2). 2015 Alaturka: Style in Turkish Music, by J. M. O’Connell. Music and Letters 96(3). 2013 Divine Inspirations: Music and Islam in Indonesia, ed. by A. Rasmussen and D. Harnish. Indonesia 93. 2012 Republic of Love: Cultural Intimacy in Turkish Popular Music by M. Stokes. the world of music 53(1). 2011 Recorded Music: Performance, Culture and Technology ed. by A. Bayley. Notes 68(2). 2010 The World Map of Music: The Edison Phonograph and the Musical Cartography of the Earth. Berlin Phonogram Archive. Ethnomusicology 54(3). 2005 You Better Work! by Kai Fikentscher. Ethnomusicology 49(2).